Do you work in a field that requires you to support individuals who have difficulty regulating their emotions? Do they seem irrational at times and make decisions that only compound their difficulties? Do these emotionally sensitive individuals frequently talk about suicide? Do you feel you are not adequately prepared to manage crisis situations with the individuals you support and would like to broaden your understanding and develop skills to manage more effectively? 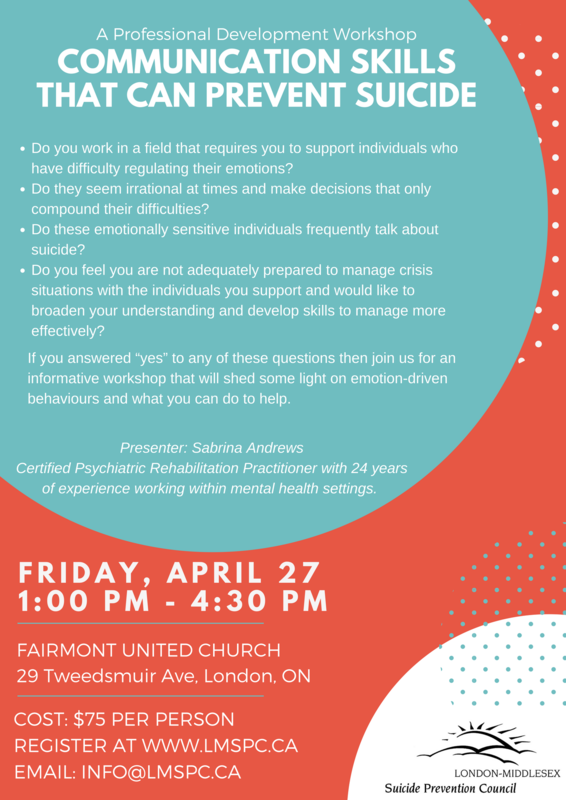 If you answered “yes” to any of these questions then join us for an informative workshop that will shed some light on emotion-driven behaviours and what you can do to help. This informative afternoon workshop will help you understand emotional dysregulation, the effects of adverse experiences on cognition, how personality impacts the choices your client makes and how you can make the necessary accommodations to motivate change and promote recovery! This is a skills-based workshop so be prepared to actively participate and come away with concrete strategies for effective crisis communication. Presenter: Sabrina Andrews is a Certified Psychiatric Rehabilitation Practitioner with 24 years of experience working within mental health settings. She has provided direct service to both youth and adults and is a master trainer in Applied Suicide Intervention Skills (ASIST). A natural storyteller, Sabrina will help you understand how to support recovery and motivate change. LMSPC is able to provide a full refund, minus a $5 administrative fee, for requests made up to 15 days prior to the workshop. After 15 days, you may designate a substitute to attend in your place provided that you notify us at least 2 business days prior to the workshop.